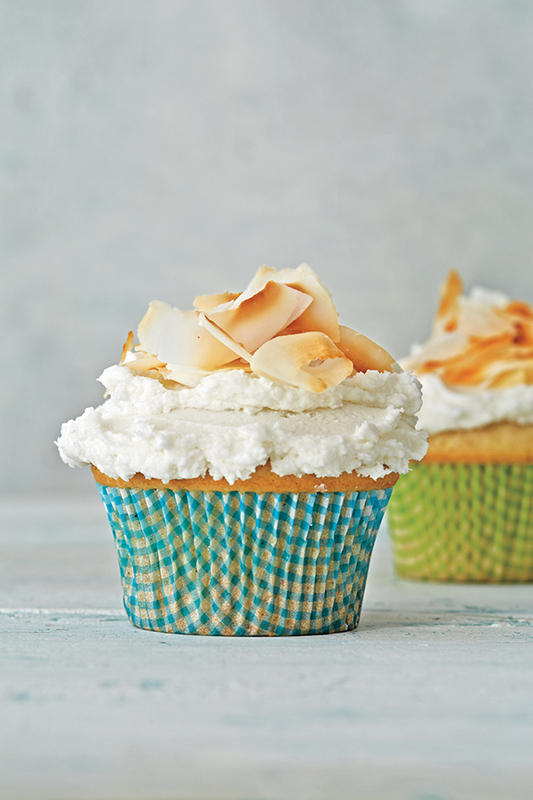 These vegan Coconut Cupcakes look especially pretty with toasted large flakes of toasted coconut sprinkled on the frosting. They’re a great treat to serve on Easter. These cupcakes look especially pretty with toasted large flakes of toasted coconut sprinkled on the frosting. Cupcakes: Preheat the oven to 350° degrees F. Line a 12-cup muffin tin with cupcake liners. Set aside. In a small bowl, combine the coconut milk and vinegar and set aside. In a medium bowl, combine the flour, cornstarch, nutmeg, salt, baking powder, and baking soda, and salt. Mix to combine. In a large bowl, combine the sugar, oil, and coconut extract. Stir in the reserved coconut milk mixture. Add the dry ingredients to the wet ingredients and stir until smooth. Pour the batter evenly into the prepared tin and bake until a toothpick inserted in the center of a cupcake comes out clean, 20 to 25 minutes. Cool completely before frosting. Frosting: While the cupcakes are cooling, make the frosting. In a large bowl, cream the butter with an electric mixer on high speed until light and fluffy. Alternatively, process it in a food processor. Add the confectioners’ sugar and coconut extract and mix until thoroughly combined. Continue mixing for about 2 minutes, or until the frosting is smooth and stiff. Refrigerate until needed. To assemble: When the cupcakes are completed cooled, frost the cooled cupcakes with the prepared frosting. Place the flaked coconut in a shallow bowl, then dip the top of each cupcake into the shredded coconut. Excerpted from 100 BEST VEGAN RECIPES, © 2016 by Robin Robertson. Used with permission of Houghton Mifflin Harcourt. All rights reserved. Photo by Lucy Schaeffer.